Mark Davis hit a break of 102 at the Coral Shoot-Out this afternoon. Mark Davis compiled a rare century break in the Coral Shoot-Out to defeat the defending champion this afternoon (Thursday). The St Leonards-based cueman knocked in a splendid run of 102 to whitewash world number 16 Anthony McGill 103-0 in round one at the Watford Colosseum. Matches in the Shoot-Out are played over a single 10-minute frame with a shot clock, so big breaks are far less common than in the traditional form of the game. 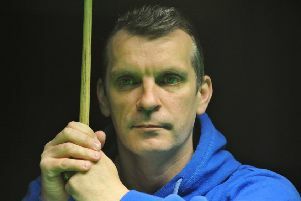 Although David Gilbert produced a 127 total clearance in the 2016 event, the highest break in last year’s tournament was a 96 by Graeme Dott, so Davis has laid down a strong early marker for the top break in 2018. World number 41 Davis, who reached the last 16 of the German Masters last week, goes forward to the last 64 of a 128-man televised tournament played under a random draw. Jimmy Robertson, the world number 34 from Bexhill, is due to play his first round match against Belgian star Luca Brecel tomorrow afternoon.